Cinderella Free Fall Game Is Available For Free! Are you going to see the Cinderella movie when it opens tomorrow? We are SO excited and just can’t wait. It is time for all things Cinderella! Today, Disney Interactive launches Cinderella Free Fall, an enchanting free-to-play puzzle adventure game! 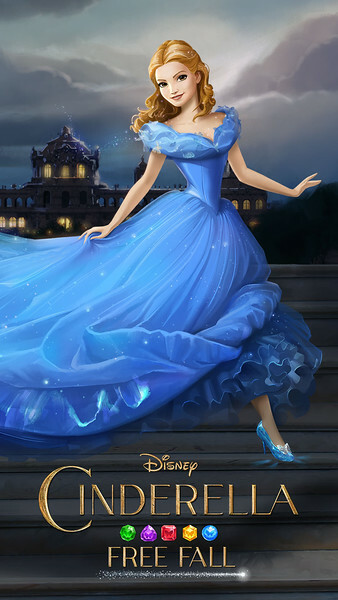 This mobile device game is inspired by Disney’s upcoming live-action film, Cinderella. In Cinderella Free Fall, players can transform into the most iconic princess of all time, connecting and matching butterfly jewels on an epic journey through the kingdom! With the help of Cinderella’s loveable animal friends, Gus and Jacqueline, players will be able to connect strings of same-colored jewels and unleash “Wish Magic” to release exciting combos! Players will begin as young Ella, following her story and progressing through 100 levels to see her stunning transformation. 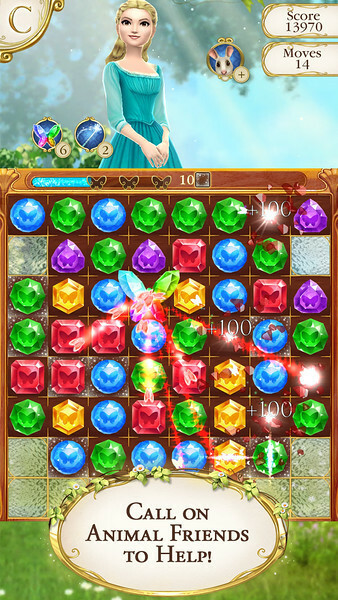 To make matches, players will connect strings of same-colored jewels. They can create longer lines to unleash ‘Wish Magic’ for powerful effects, and can connect jewels in a circle to release even more exciting combos. Cinderella’s lovable animal friends Gus and Jacqueline will join the adventure along the way, lending a helping hand in the more challenging levels. Cinderella Free Fall is the third game to launch in the successful Disney ‘Free Fall’ series, following Maleficent Free Fall and Frozen Free Fall. Together, the apps have been downloaded more than 105 million times and played for more than 51 billion minutes. Cinderella Free Fall is also available for free on the App Store at http://di.sn/6001FFIc, Google Play at http://di.sn/6007FFwT, Windows Phone at http://di.sn/6001FgEz and Windows Store at http://di.sn/6006FgEG.